The following interview was published in the “Shukan Yomiuri” newspaper on May 27, 1956, and is published with the kind permission of the Yomiuri Shimbun Company. The text is being presented in two instalments, this being the second. 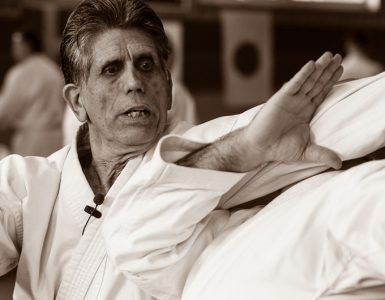 O-Sensei was at the time 72 years of age. That’s right. The things that have occurred up until now could not have been avoided and we are still a feudalistic country. Therefore, what I am suggesting is that we should discard our old clothes and convert Japan into a true, new country which we should all serve. This is what I would like to happen. You work hard and deal wisely with those you dislike and set an example no matter what people say about you… Well, having too many fools like this is a problem too, isn’t it? “Fool” (ahoo) is written with two Chinese characters which mean “easy to handle”. Well, if everybody becomes a “fool” the world will be easy to handle, won’t it? I am content to be called a fool. This fool thinks in his own way and doesn’t belong to any group. Those who are making a scene are the ones who want to show how great they are. There is nothing to be gained by participating in such a group. (O-Sensei recites a poem) “The beautiful form of heaven and earth is a manifestation of a single family created by the kami…” Although I am an ignorant fool, it is my opinion that, if there is no center in a family, it is the same as several different families living in a single household. Such a conglomeration of families doesn’t work. Everybody insists on expressing his own opinion and a leader cannot be chosen. But if there really is a great individual, everyone will follow him at any time. I have my assigned mission which I must complete and you, Sir, have your own mission. A newspaper has its own mission and a farmer his. Everyone has his own mission. Thus, all we have to do is to complete our heavenly chosen missions. If this were the case, there wouldn’t be any disagreements, would there? If you said the mission of the rich was to be rich and that of the poor to be poor, the poor would not hear of it. I am not talking about money here. I intend to complete my mission obediently. However, in a world where people such as military officers and government officials prevent you from completing your mission by putting too much emphasis on the “Emperor,” our country will end up in the same way as before. It’s pointless to complain about them not allowing you to complete your mission since the military has weapons. You are helpless. Such weapons will no longer be needed. Nothing will ever be done about this as long as one takes the attitude that he will reduce arms only when others reduce them. That’s why I am talking about getting rid of militarism psychologically. There are people who have attempted to place Japan in the center of the universe and who have died hated. There are also those who have died prevented in their attempts to advocate democracy. Since the world has been corrupted in this way, we should immediately discard such ways and take prompt action. We must purify our land. You, Sir, may not know what I mean by “purifying the land.” I am not talking about “misogi” (purification) in the old sense, which doesn’t work. The misogi of today has already been transformed. But at the same time, we should believe in what is recorded in classical Japanese literature. The fact that the world was created through the subtle vibrations of the 75 sounds is written there. 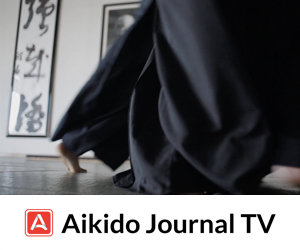 Clarification of the method of purifying all things and all people is Aikido. 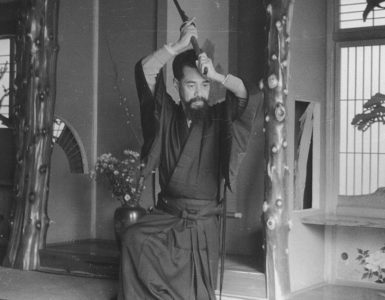 It is the realm of action imbued with the spirit of the kami (lit., the heaven and earth of “saisei-itchi” ). This is the great democracy. There are some who say that “saisei itchi” is an excuse for the emperor to create a military government, but that is ridiculous. It is the great democracy, the great principle of nonresistance. I like the principle of nonresistance. I want to enter into contact with pacifists. It is the religious zealots who are the most behind the times. What do you think can be accomplished by such stubborn fools? The only thing they can do is make money. I very much enjoy praying to the kami (deities). I feel really good when I bow my head with my hands clasped in prayer. It is with a feeling of appreciation that I clap hands in front of the altar when I get up in the morning. My children laugh at me, though, saying that I am old-fashioned. I think that it is quite the opposite. I am modern. The reason for this is that I contain the universe in my bosom. I hold in my bosom the ancient ages of the kami, today and the future. The kami dwell in healthy people. Great power is given to healthy people. Look at the sun. It is dazzling, isn’t it? But it is not at all dazzling to me, and I can look at it as much as I want. I make friends with the sun. The sun is at my side. If even one star passes it will influence me. I live in the same universe. I find it’s almost impossible to follow what you are saying. Let me ask you about the old days. Would you relate some episodes about your feats? I have forgotten such episodes. When I was a young man I thought I would serve the people of the world using my physical strength. In those days, when I looked at the world, I only found persons who were wise but not physically strong. So I decided to offer my body to everyone. For example, when I went to the home of a religious person, it was my work to arrange everyone’s slippers while wearing a half-coat or waistcoat. You mean you took care of footgear? I was used to taking care of footgear and growing vegetables. It is like the “Itoen”  where you start by learning how to clean toilets. Since I had a mission to accomplish, I couldn’t be involved only in that kind of work. I had many low-level jobs though. Somehow, I gradually became healthier while engaged in this kind of menial work. At one time, I was with Onisaburo Deguchi of the Omoto religion. He said they were going to transplant a thick chinquapin tree this big. Many Omoto believers tried to dislodge the tree by using a stick like this but it didn’t budge an inch. While watching them I suddenly decided to go and move that tree. The moment I decided to do that my whole body became red and warm as though I had taken a bath, and tears began to stream out of my eyes. They were tears of indignation. I wondered why peoples of the world couldn’t get along. At least, we Japanese should be friends. I shed tears of indignation. Then when I worked on the tree alone, it moved gently although it had failed to budge when many attempted to move it. My tears of indignation brought me power in that situation. Onisaburo Deguchi Sensei said that I was divinely inspired. That was why I adopted the nickname of “Rikizo” (lit., “power storage”). I would move a stone bridge weighing more than 2,000 pounds by myself. You were an Omoto believer then, weren’t you? How about now? I imagine they don’t want to recognize me now as one of them. What made you become a follower of Omoto at that time? It was because it cured my father’s illness. Did he recover from his illness? The Omoto still accept me as an ordinary member. The Omoto religion represents the great principle of democracy. I have never met a greater person than Onisaburo Deguchi Sensei. He was a great advocate of democracy. He was mistaken many times to be a member of the communist party. He was a great man. I learned from him the study of the kotodama . I wasn’t taught by him. I learned it naturally being with him. Once I dragged two leaders of the religion by the collar and took them home about midnight. They begged me not to take them like that but I told them I found their opinions to be really rubbish and took them home. I had many matches, but was never beaten. There was a time when I went around carrying a bamboo sword. There was a sumo wrestler you defeated, wasn’t there? There were Tenryu and Onosato. When the latter came to attack me here, I lifted him lightly and threw him. There was a man named Toranosuke Matsumoto who, I regret to say, passed away in the Soviet Union, who suggested that Tenryu test my strength. Tenryu was laughing then. He was over six feet tall and weighed something over 240 pounds. I was such a small man, it was impossible to have a sumo match with him. In any event, I told him to have a try. I grabbed his hand lightly. Then I told him to push me back hard. Although he was pushing me with all his might I said to him, “You don’t have much power, do you?”. Then I moved slightly and he fell. I was sitting the whole time. 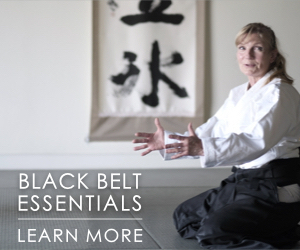 In any peaceful Japanese martial art, harmony is important. You have power when you are calm. If you are too eager, you lose. 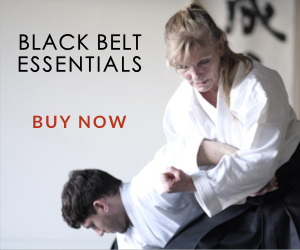 In other words, Aiki means to conquer something correctly. You overcome your own sword. This is called “katsuhayabi”  and is much faster than the sun, the moon and the earth. The reason is that you are the universe itself. There is nothing faster or slower in the universe. There is nothing greater. I am sure that not even Tenryu could deal with the universe. What did you do during the war? I was alone during the war. I was in charge of all of the army and navy schools. I had three cars and never used public transportation. They wouldn’t let me. At that time, when I traveled, I would get a first class white ticket. Now it is hard for me to travel because the ticket is the regular red ticket. 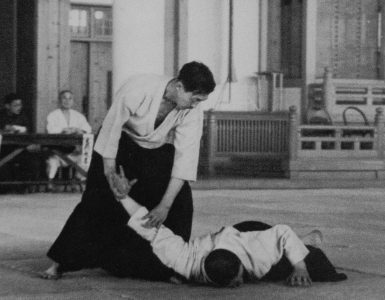 Could the military officers understand the spirit of Aikido? No, they couldn’t. 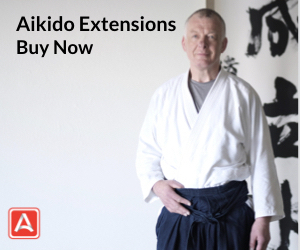 Military officers base themselves on battles but I was based on myself, on Aiki. Even if you explained this to them they would not have answered, “Aye, aye, Sir”, would they? They would just say, “Aiya, aiya. !” (Roughly equivalent to “en garde”, a play on the words used above by the interviewer). Wow! 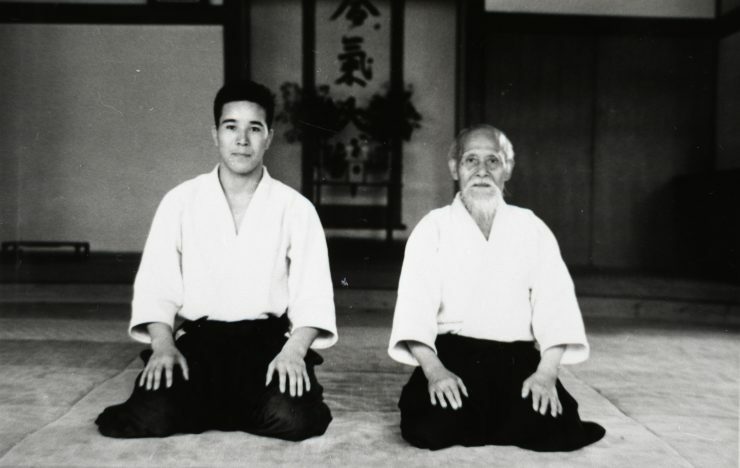 This article is 55 years old, yet it’s the first one that I’ve read (after 40 years in the martial arts) were O’Sensei talks politics and not just aikido or spirituality concepts. Thanks for reprinting it. I found the honesty of the interviewer admitting to O’Sensei that at times it was difficult to understand and follow him amusing and refreshing. Will we see part one of the interview? I’ll track down part one in the near future. I hope you find the first part!